Cardiovascular physical examination being performed on a patient. An examination begins with a detailed discussion with the owner in which the reason for the animal's visit, the history of the problem, and any previous evaluation or treatment is discussed. This will include the pet's diet, vaccinations, other medical issues (related and unrelated to the current problem) and any medications or supplements that the pet is being given (and whether these have worked or caused other reactions). Information regarding when a symptom of heart disease began, as well as its frequency, duration, and whether it seems related to another event or activity, will be very important for the veterinarian in determining if the animal has a heart problem. 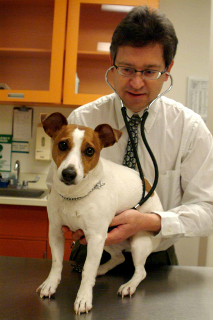 After taking the history, a physical examination will be performed, which includes listening to the heart and lungs with a stethoscope (auscultation), feeling the heartbeat on the chest, evaluating the pulses, looking at the color of the pet's gums and large veins in the neck. If there are any abnormalities found during this exam, the veterinarian may suggest other diagnostic procedures in order to determine a specific problem. Additionally, the exam might be relatively normal, but if the veterinarian is suspicious of a heart problem, further testing may be helpful in determining or eliminating possible causes of the problem the animal was brought in for.